Lest you think the show was some kind of sausagefest, far from it – I’d say the majority of Mayfield’s fans at this show were women, and most of them seemed able to sing just about every word. This was the most packed I’ve seen Glasslands on a Thursday in ages, and it’s not hard to see why. Mayfield’s latest record, the Dan Auerbach-produced Tell Me, moves Mayfield beyond her neo-country confines and continues her tradition of strong songwriting – see for example “Run Myself Into the Ground”, which maintains a hint of twang but backs it with some solidly rock guitar work. That came courtesy of Nashville’s Richie Kirkpatrick, whose band Ri¢hie has also served as Mayfield’s rhythm section at several recent shows. This was my first introduction to Jessica live, and I was extremely pleased with both the show and the crowd. The only thing that could have made the night better would have been her performing her new cover of Nirvana’s “Lounge Act”! Johnny Fried Chicken Boy had a similar experience with Mayfield this April Fool’s Day at Bowery Ballroom, where he recorded a somewhat different set before an equally pumped up audience. That show is also offered as a download here. The Glasslands show was a fairly sophisticated recording for us, with a pair of DPA omnidirectional mics onstage, Schoeps “open cardiods” mounted an optimal distance from the stacks, and a soundboard feed running into two clock-synced decks run by myself and Johnny Fried Chicken Boy. It is an outstanding capture at the very top of the range for this site. John’s Bowery recording is an excellent four-microphone recording from our usual spot at Bowery that is also not to be missed. Enjoy! 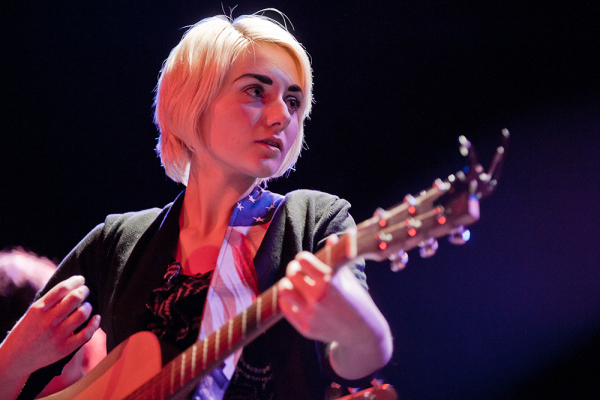 If you enjoyed these recordings, PLEASE SUPPORT Jessica Lea Mayfield, visit her website, and purchase her latest record Tell Me and other merch from the store at her website [HERE].